Men who went to see the Pittsburgh Pirates at PNC Park during Prostate Cancer Awareness Month in September saw Physicians Committee ads urging them to “Play Hardball against Prostate Cancer” by eliminating milk from their diets. The ads, which were posted in each of the 20 men’s rooms in the stadium, warned that studies show that dairy products increase prostate cancer risk. The Physicians Health Study showed a 34 percent increased risk of prostate cancer for men consuming more than two and a half servings of dairy products per day, compared with men consuming less than a half serving per day. In the Health Professionals Follow-Up Study, risk was 60 percent higher for men consuming two milk servings per day, compared with zero servings per day. In 2012, Pennsylvania ranked fifth in total milk production in the United States, with about 10.58 billion pounds of milk. 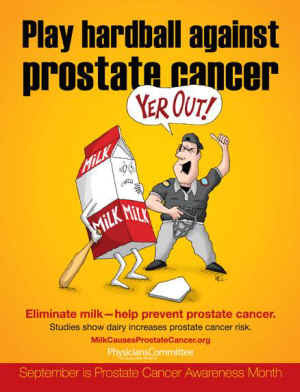 To learn more about the link between milk and prostate cancer, visit www.MilkCausesProstateCancer.org.